Primarily, false cut used in different and many card magic. It is the name of the move for cutting deck several times within the hand by giving a look that you are shuffling. You will need to make sure while shuffling you should keep the card in the same exact order in these were before this move. It is probably the first and most important first venture for beginners in card flourishes. Let us tell you everyone is using different or their own way of doing a false cut. There are multiple variations to do false cut. Those magicians have enough skill and experience in handling cards usually incorporate with fancier sleight of hand. Why this move need to be fancy? It is important to give the appearance as you are really shuffling the deck. It needs to give the appearance that several shuffling are being performed by incorporating more flourishes and cuts. But here we are going to explain the easiest false cut today. This one is the perfect for beginners. However, it might look truly difficult at first sight, but believe us you will be the master of this move in just a little practice. Step 2: Hold on and then split the stack and take a quick pee in the last card by just rotating it in same hand. Step 3:Now place this stack below the other pile by flipping it and putting a finger in between the two stacks. Step 4: Now take another pile and again peep in through the last card and then put it up on the second pile and in the mid of the process flip the last pile and see the card . Step 5: Now flip the last pile and place it above all the piles so that all the points are determined. Step 6: Now take out the lower most card then the one where finger was placed and the top most and here you are with the known cards. Do you want to learn false cut, but do not want to practice much then the above mentioned false cut is the perfect for you. Here we will tell the easiest false cut ever. 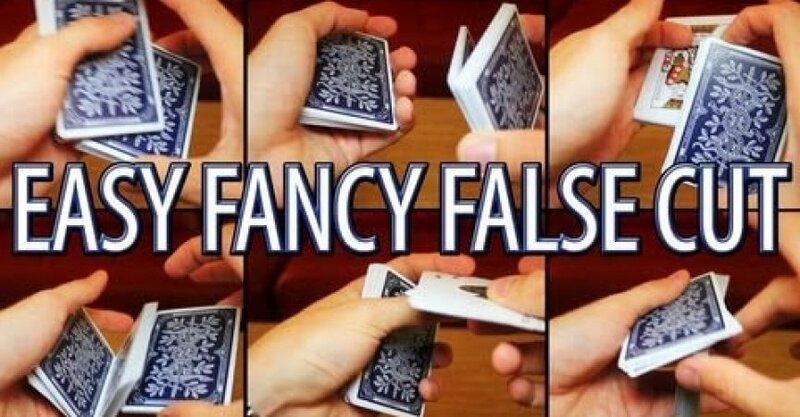 This move of false cut is extremely easy and do not take enough to be a master. However, this move is not at all fancy, and sometimes people might catch that you did not perfectly shuffle the deck. The move of false cut is extremely fun to do once you master it. As I have seen new magicians, who are practicing the false cut, and then they gripped card flourishes.